THE PECULIAR CASE OF KHORASAN: MORE DANGEROUS THAN ISIS? Removing terrorism is easier said than done. Although Osama bin Laden is dead and al-Qaeda is falling apart, there are many other dangerous terrorist organizations that appear to be a far greater threat. Most people are aware of the terrorist group ISIS (Islamic State of Iraq and Syria), also known as ISIL, and the brutalities they have performed. ISIS has around 40,000 fighters, as well as thousands of people, who against their will, are under the group’s control; ISIS has an estimated revenue of $3 million a day. They have taken over large territories in Syria and Iraq, as well as committed ethnic cleansing and genocide towards Yazidis, Kurds, Christians and other minority groups living in that area. Additionally, ISIS is able to recruit westerners at a growing rate through the use of social media. However, in September 2014, the terrorist group Khorasan was reported to the American public to be a far greater threat than ISIS. This is shocking, especially when considering its actual size and magnitude. First, its existence was unknown to most Americans and it was only recently that information about Khorasan was made public. Second, due to the lack of information about Khorasan, many experts disagree about specific details regarding it. While some view the group as more problematic than ISIS, others say it is a part of existing militant groups and that its threat is being exaggerated. Additionally, there are even some skeptics who go as far to claim that Khorasan does not exist and is instead being reported on by the media in order to justify U.S. military intervention in Syria. Thus, in order to understand what Khorasan really is and who its members are (and to know if it even exists at all), it is important to know some background information and viewpoints regarding the group. Who and what is Khorasan? First, Khorasan is not the actual name of the terrorist organization. Its real name is unknown. The term Khorasan happens to be the name of a historical region made up of parts of modern-day Turkmenistan, Afghanistan and Iran. The region of Khorasan has a dark history. It was conquered by the Umayyad Caliphate in the 7th century and later became immersed in Islam. The Abbasid revolution, which eventually toppled the Umayyads, originally started in Khorasan. As a result of this past, many jihadis still use the term Khorasan. al-Qaeda’s online magazine happens to be named “Vanguards of Khorasan.” It is believed that the majority of its members are from the region. al-Qaeda even refers to the region encompassing parts of Iran, Afghanistan and Pakistan as Khorasan. Moreover, US intelligence refers to this group as Khorasan because of its location and lack of further information available. Despite this, jihadis in Syria have never used the name Khorasan to refer to themselves. Khorasan is a terrorist organization believed to have been created in 2012 by high-ranking former members of al-Qaeda. Unlike ISIS, Khorasan only has around 50 fighters in its ranks. It is composed of a diverse group of people including elite snipers of Al-Nusra, important officials from al-Qaeda such as Muhsin al-Fahdli, fanatic jihadis zealous towards militant Islam, bomb makers from all over the world such as Yemenese bomb maker, Ibrahim al-Asiri, who was the chief bomb maker for al-Qaeda in the Arabian peninsula and many other types of people. Another notable member of this group was David Drugeon, a French national who formerly worked for French intelligence. Khorasan’s supposed leader was Muhsin al-Fahdli, a seasoned veteran of al-Qaeda who fled to Iran following the U.S.-led invasion of Afghanistan. While al-Fahdli is believed to have been killed from the airstrikes in Syria in September, his death is unconfirmed. In fact, there have been reports that he survived the attack. However, al-Fahdli may not have even been the leader himself. It is important to know who the leader of a terrorist militant organization is. Leaders in these terrorist groups often hold a great deal of influence over members and are usually the masterminds behind attacks. However, due to the structure of how these organizations are set up in that they have evolved from a hierarchical based organization to more of a network based group, it is often difficult to determine who the leader of the organization is in the first place. However, because of the networked structure in which terrorists are often able to associate with one another through shared ideology and family ties, as opposed to the hierarchical structure with a clear set of leaders, it is often difficult to replace the leaders once they have been killed. Terrorist groups whose leaders have been killed experience higher mortality rates than those who have not. That is why it is crucial to know the identity of the leader of Khorasan. Recent reports have pointed to another man who may be the leader, Mohammed Islamboui, an Egyptian linked to the leader of al-Qaeda, Ayman al Zawahiri. Mohammed Islamboui is the older brother of Khalid Islamboui, who assassinated Egyptian President Anwar al Sadat in 1982. Another brother, Showqi Al-Islamboui, attempted to assassinate former Egyptian President Hosni Mubarak back in 1995. Despite Khorasan being small in number, this group is made up of some of the most dangerous and seasoned terrorist militants, thus making it a powerful threat that needs to be dealt with. How is Khorasan different from ISIS? This group is radically different from ISIS, in not only its composition of members, but also in its ideology and its goals. ISIS has plans to simply establish an Islamic Caliphate in the Levant area and rule with an iron fist while practicing an extreme and false form of Islam, and is less concerned about orchestrating terrorist attacks on western countries. On the other hand, Khorasan’s main focus is discovering new ways to attack Europe and the United States. In contrast, ISIS does not have any plans to attack American soil despite their rhetoric on attacking Americans. In fact, U.S. officials assert that ISIS does not pose a direct threat to U.S. homeland at the moment. Meanwhile, Khorasan plans on wreaking havoc on the United States and other parts of the Western world. Another key difference between the two organizations is that Khorasan is affiliated with al-Qaeda and is made up of a few dozen veteran al-Qaeda veterans. ISIS is against al-Qaeda, has no affiliation with it whatsoever and is composed of a much larger number of fighters. Initially, there were reports of Khorasan developing plans to create “a bomb made of a nonmetallic device like a toothpaste container or clothes dipped in explosive material” in order to commit these attacks. However, since then, U.S. government officials have stated that they are unsure of Khorasan’s plans in near term. FBI director James Comey admitted in an interview that even he himself was unsure of the specifics of an attack from Khorasan, but claimed that Khorasan would attack very soon. This level of uncertainty from government officials has brought some doubt about Khorasan’s capabilities. Limited knowledge about the group is detrimental to national security as it tells us that we are not exactly sure about the true magnitude of destruction Khorasan could be capable of. A terrorist group that is growing increasingly powerful without being watched leaves many unanswered questions. It leaves us uncertain about when their next attack might arrive and what exactly they would do. This uncertainty about the nature of the organization has even led many skeptics to argue against its existence. The Carnegie Endowment for International Peace has criticized the media’s portrayal of Khorasan and suggests that Khorasan is probably not even an independent organization, but rather a loose network of terrorists connected through similar goals and who all happen to be assigned to the same missions. Reporters Glenn Greenwald and Murtaza Hussain have also questioned the existence of Khorasan and whether it even actually poses a threat, stating that this is probably just U.S. propaganda used to justify military intervention in Syria. It is also still debated whether Khorasan is a distinct terrorist organization. Some scholars speculate that Khorasan is no different from, and is just a branch of al-Nusra. 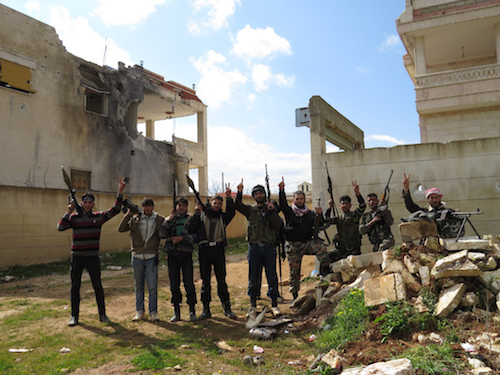 Others say that it is an independent group of fighters allied with and dependent on al-Nusra. A majority of Khorasan’s members are al-Qaeda affiliated which has led skeptics to allege that this group is not independent from al-Qaeda. Since al-Nusra is al-Qaeda’s affiliate in Syria, skeptics argue that Khorasan may simply be a part of al-Nusra. The amount of conflicting information from U.S. officials pertaining to the threat of Khorasan is also shocking. Despite FBI director James Comey stating that he was unsure of what the exact plans of Khorasan were, the director of operations for the Joint Chiefs of Staff, William Mayville Jr., announced to reporters weeks ago that Khorasan was in its “final stages of plans to execute major attacks against Western targets and potentially the U.S. homeland.” Conflicting reports such as these further add to the amount of distrust and weaken the reliability of reports that suggest that Khorasan is an imminent threat. However, we should not forget that we are still in the early stages of gleaning information about this group and finding out who exactly they are. Thus, it should not be a surprise that initial reports may contradict one another in the beginning. Why would there be reports about an organization that is not real? Even if Khorasan is not a real terrorist organization, but rather just a term used by U.S. officials in order to refer to militants who actually are part of other organizations, it adds to the fears of many Americans that terrorist groups are still a potent threat despite the disfigurement of al-Qaeda and the death of bin Laden. By referring to these terrorists as members of Khorasan, it will not bring back memories of al-Qaeda or remind Americans that al-Qaeda affiliated organizations are still operating despite the War on Terror starting over a decade ago, but will instead alert the general public that new terrorist groups that are different from al-Qaeda are emerging. However, one cannot deny the overwhelming amount of evidence pointing to the existence of the group. Although there is skepticism because of the lack of information about Khorasan, evidence already points towards its existence. There is already significant proof about individual members of this organization such as David Drugeon and Ibrahim Al-asiri. Moreover, just recently, members of the Syrian National Army attacked a group of terrorists who were members of Khorasan. Furthermore, U.S. airstrikes in the region destroyed many facilities which were also later discovered to be used by Khorasan. Because we do not know much about this terrorist group, we unfortunately do not know its true capabilities, but evidence does suggest that it is a threat that cannot be ignored. If there is one threat that should not be ignored, it is the threat of power of unknown magnitude, which is exactly what Khorasan is.